CIM was amazing. Despite the cold weather, my ankle and training worries, and my generally nervous attitude about the marathon, I finished in 4:28:42 - a 15 minute PR. Kevin also had a great race and PR running 3:48:59. And if that isn't enough, there were many awesome race stories and PRs from my friends and Oiselle team mates too. Yay, CIM success! I always enjoy seeing a list like the one below on the Oiselle site. Backing up a bit, Kevin and I headed to Sacramento on Saturday morning after a leisurely breakfast and packing session to keep ourselves relaxed. We walked over to Chipotle for lunch and then to the expo to grab our packets. We didn't do as much walking around the expo, but we went to say hello to Lark at the San Francisco Marathon booth and then met up with a few Oiselle team ladies to chat. Seeing them really helped my race nerves; if you girls are reading this, thank you for being such a great support network. The rest of the day was very low key. We grabbed a beer in the hotel bar, watched the Ohio State vs. Michigan State game (we lost, boo! ), and ordered room service for dinner. That plan worked great before St. Louis, so a repeat was in order. I went through the weather again and planned my race day attire, which changed once again race morning to add a heavier long sleeve shirt. I'm glad I did. Flyte long sleeve, Lesley knicker, randies. Not pictured: Lux layer I actually wore. We went to bed fairly early, but I had trouble sleeping as usual and woke up nauseous on Sunday morning. I told myself just stay calm, the race start is 2.5 hours away and you'll be fine. Luckily, it went away after an hour or so. We met up with Ayesha and then waited in a very cold line for the bus for about 15 minutes. Brrr! The bus line at the Sheraton and Convention Center pick up spot was much longer than I expected. We hopped on the school bus (some of them even had snow on top) and rode about 30 minutes to the start line. When we arrived I hurried off the bus to the porta potties and waited in another really long line. It was freezing. Thank goodness they let us get back on the bus until almost start time to stay warmer. Let us on the bus STAT. I'd been skeptical about my race strategy or even running at all, mostly due to the lack of long runs and especially recent long runs with the ankle situation. One thought was to take it super easy, not try to PR, and run with the 4:40 group at a very easy pace. I'd also considered running with the 4:10 pace group with Ayesha for the first half (and as long as I could hang on after that), then dropping back when I needed to. The theory was that I knew I could run a solid half at that pace based on Berkeley, and if I crashed hard because of a lower training base I'd just need a 2:25 half to hit my 4:30 goal. Perhaps a sketchy plan, but after some hesitation at the start line I went with it. The start was much more crowded than last year and it was had to stay with the pace group because of the crowd. I'm not sure why I didn't have that issue last year, although I do know that 2500 or so less people ended up starting in 2012 because of the stormy conditions. That might have made the course easier to navigate. Even when it thinned a bit, the 4:10 pacers were all over the place and didn't seem to be looking at their watches at all. About 3 miles in Ayesha I decided to run our own 9:30 pace more steadily, and 4 or 5 times we passed the 4:10s, they passed us, etc. It definitely wasn't the pace group experience I had with 4:40 last year; Vickie was right on and awesome. One of the more interesting things about the race was the water stops - with temperatures below freezing, they turned into skating rinks! You had to be super careful going through them and quite a few people fell or skidded into other runners. The second funny part was remembering where all of the big puddles were last year and how we navigated around one of the deepest ones. The course looks quite different when you can see and it's not covered in water. Anyway, I came through the first half right around 2:05 as planned. After that I let Ayesha go on for her 4:10 goal (yep, she got it!) and backed off a bit because I felt more tired than I preferred for mile 13. I took some fuel, took a walk break, took off my ear warmer, and then went back to it. I felt pretty good until around mile 17, a normal wall for me, and then I took a couple of walk breaks again. At the time, I started doubting my ability to finish the race, but looking back I know I was fine. I just had to exorcise the mental demons that were doubting my training. From mile 17 on, I focused on one mile at a time. I knew each mile had to be under a certain pace to PR, and I made sure to hit that pace with padding. Whatever happened in the mile after it didn't matter, just that one did. This worked for me during the rest of the race. Before I knew it, I was counting down the final two miles and had a bit of a second wind to run it in. I was going to hit my 4:30 goal! What?! Seeing so many people cheering in the last couple of miles made me all smiles, and I saw a few people I recognized too. Turning the corner to the finish line felt amazing and I gave it what I had until the end. I raised my arms high and crossed the finish line, thrilled. The first thing offered to me after the finish line was a can of Coca-Cola, which I turned down and then went back for. It's very unusual for me to drink soda, but I figured liquid calories are good. Drinking it after the race made it taste more wonderful than I've ever thought. Special kudos to the volunteer handing them out for opening the can for me; I'm not sure I could have managed it myself right then. Kevin found me and we headed back to the hotel immediately. I felt cold and wasn't interested in solid food even though they had plenty of it at the finish line. I have to say, the cold weather wasn't as bad as I thought but definitely affected my muscles. My calves ended up crampy at the end and after sweating I became chilled for the last few miles. My toes were numb at the start but warmed up after about 5 miles so I could feel them again. 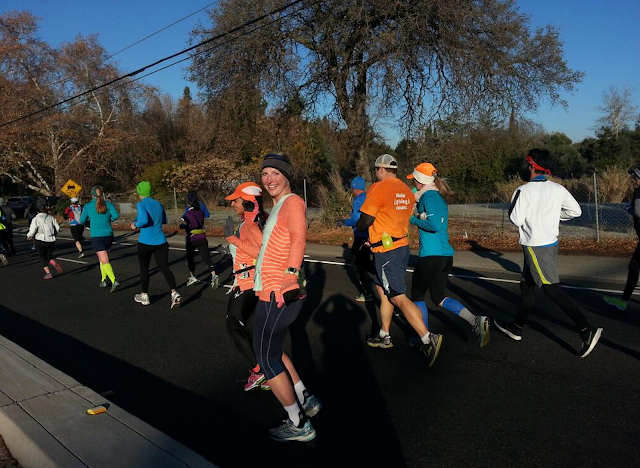 25-30 degrees isn't that cold in the grand scheme of winter, but it's cold for running 26.2. I wish I'd taken some finish area photos, but getting the phone out of my FlipBelt when I was tired and cold didn't seem to be a priority. Instead, we have hotel photos like last year. Kev and I back at the Sheraton. Now for the race details. Expo. The expo isn't huge, but it's most definitely sufficient. They had a few booths for other races, some run store vendors, Nuun and additional food sampling, and the usual booths such as the Stick and headbands. I didn't wait in line at all to get my bib or shirt, and they had a place to test shoe tags to make sure all was well. The outside area of the expo room was fun because it had a sign for each year of CIM with memorable details from that year. Shirts. Blue for ladies, gray for men. The 30th Anniversary race sign. Last year's crazy weather. Support. Aside from the unavoidable ice, aid stations were good and had both water and Powerade. The Powerade was mixed light enough that it didn't upset my stomach so I used it near the end (after accidentally taking it the first time.) They had 3 different places where they handed out Gu with flavor choice of Vanilla or Orange, plus there 2 were spots with oranges. Porta potties were available near each aid station. The volunteers and spectators were great and there were many of both along the way. I even saw Tennille around mile 12, thanks for cheering lady! Finish Line. Although I didn't stay for food, Kevin gave me the scoop. They had Whole Foods soup and Naan bread, Kind granola bars, bananas, coconut water, water, and of course the Coke I had. They gave us the heat sheets when we finished. I was excited the volunteers both wrapped me in the heat sheet and put my medal over my head - it's the little things that can make a difference. This race has a separate men's and women's finish, although I'm not sure why. They tend to highlight it as a perk for some reason. If nothing else, it probably does make the chute less crowded due to the road set up. I'm happy to have had another great year at CIM! Congrats! It seems like pretty much everyone had a great race at CIM! I'm the same way with soda - I really don't ever want it. But when I do, oh man, it's the best tasting thing ever. I crave it sometimes after long runs but never have it since I don't keep it in the house! Thank you! Agree - CIM went well for lots of people, so exciting. Congratulations Paulette!!!! What a great PR after a rough training cycle!! 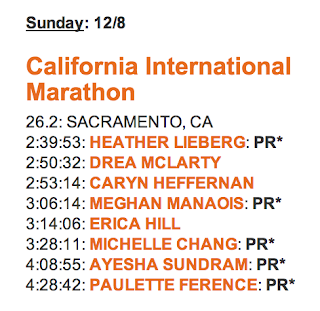 I can't believe how many people had fantastic races at CIM this year. Cold is way better than the monsoon that was last year, haha! Great job!!! Congrats! I'm pretty sure we started the race near one another. I noticed your Oiselle singlets near the 4:10 pacer! I would keep this year's weather over last year's weather any day :) Ps - your celebratory dessert is one of my faves from the Cafeteria! Thanks! I agree - so nice not to be drenched this time around. I loved running the course again. That's so funny you were near us, hopefully sometime we can meet to say hi! Smores looks fierce, but well deserved! Congrats!!! You are such an awesome runner. 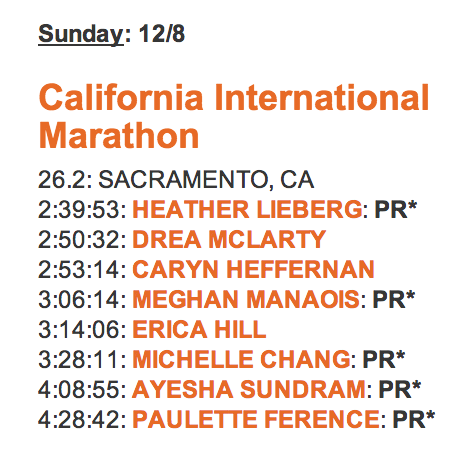 After hearing everyone's experiences, I'm sad I didn't run CIM this year... next year! The gear is super cute this time too. But enough about that you, CONGRATS again! Thanks Meg! So sweet. I'm not sure if I'll do CIM next year or not, but if not I hope to come cheer! Great job Paulette! You are KILLING your goals this year! Congrats on a new marathon PR!! Great job keeping up a strong pace even when you were getting tired at the end. Congrats on the new PR!! So exciting. The course looked completely different this year, both my husband and I thought so too. I was the one that cheered at mile 25.5ish or so. I had no idea you were on pace for such a huge PR; you didn't look tired at all!! Congrats on the strong finish! Thanks - I definitely felt tired. :) AND thanks so much for cheering, it made me so happy! AWESOME! Congrats on the new PR! I knew you could do it! Awesome race Paulette! I'm always a starving marvin after a race. I even drank COCONUT water after a race & manage to shug half before the liquid fermentation got to me. *shivers & grosses out*. Congrats! And thumbs up for conquering those last miles just one at a time. I think that's the best way to get through a tough patch. Great job, and awesome PR. Thanks for sharing your report! Congrats on the PR! And I remember how cold it was that day, glad you made it safely - I heard stories of runners falling on the black ice from it being too cold. Thank you! My friend fell on the ice because someone fell into her - not good. I read in the recap from the race that they added road salt to their list of things to have on hand. haha. Congratulations on a wonderful race and a PR! I love your rosy cheeks in the hotel medal photo...you look like you'd been outside in the cold for a long time ;) Great running!! Great race report and glad you harvested a nice PR! It was freakin' cold yes! Road salt a crazy thing to need in Sacto! 2014 I'm going to be there for sure.